This morning I have been running around getting ready to head out the door quickly for an appointment I have a few towns over. 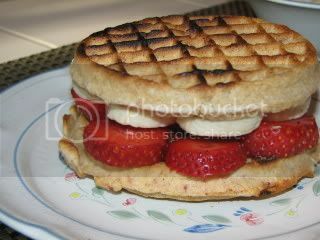 I wanted to make something that would fuel me until lunchtime and a “Waffle-Wich” was the answer. 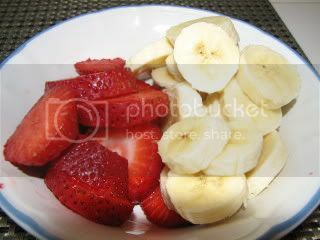 I started out with 3 big strawberries and a small banana cut into slices. 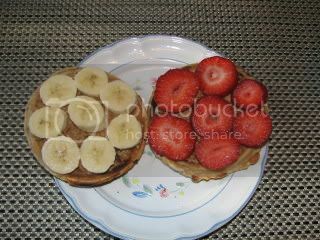 Toasted up 2 Kashi Strawberry Flax Protein Waffles and topped them with freshly ground Organic Almond Butter from Whole Foods. YUM! 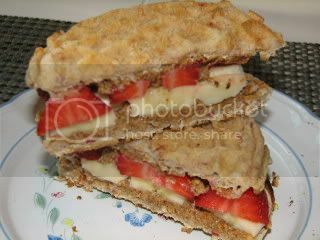 This was just like a fancy almond butter sandwich packed with protein, fruit, fiber and a little healthy fat. Oh, I should’ve used some organic unsweetened coconut too – oh well, next time! I snacked on the leftover fruit as well and hand some Decaf Cinnamon Hazelnut coffee (not pictured). I am heading out the door and won’t be back until after my run or walk depending on how my co-worker feels and lunch. See you all then. Don’t forget to vote in the BAKE SALE Poll for which item you want. There are only 3 days left! 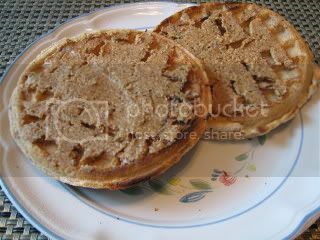 My main problem with the waffle-sandwhich is I feel like I’d wolf it down in 2.5 seconds and I need to take more time to eat to feel satisfied. Your creation does looks great, however. Hi Hallie ~ Thanks for stopping by and for the nice comment. I am so excited to see a fellow CA blogger too. I am going to make it a point to check out your site as well. I have to make it a point to each my wafflewich slowly and set it down between bites to make it last longer. It does stick with you for awhile due to protein & fiber & almond butter. Sarah ~ It’s one of my favorite combos. I do it with toast too. I personally think it tastes so much better than jam/preservers or what not.